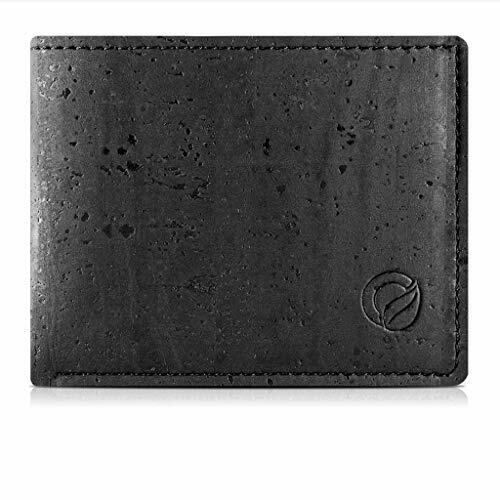 If you're trying to find vegan wallets for men, then we've got you covered. We've listed out 10 great looking wallets made from faux leather or other vegan materials. 9. 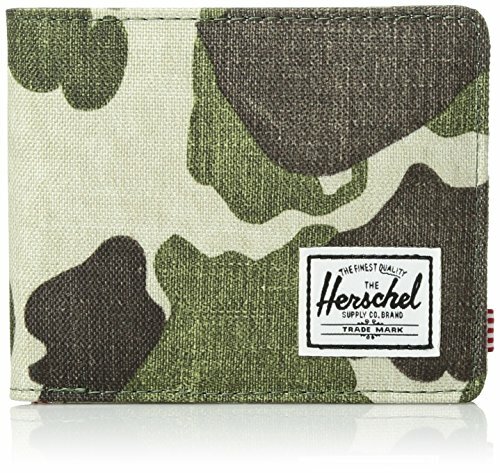 Camo Print Roy RFID Wallet by Herschel Supply Co. In the world of vegan leather alternatives, cork is an earth-friendly, renewable option with a unique look other faux leathers just can't copy. Black with a natural water-speckled pattern. Bifold design with slanted inner card slots, two hidden slip pockets and a roomy bill compartment. Pros: This wallet gets a style boost from the interesting patterns in the cork. If you want a wallet that's unlike any other you'd see, this one is for you. Cons: It isn't the slenderest wallet in case you're hunting for something more razor-thin. Matt & Nat's vintage-inspired Max wallet in olive green faux leather is classic, slim and elegant. Constructed with outer card pockets for easy functionality. Opens up in the middle to hold your cash. Pros: The guy who just needs a straightforward but attractive wallet will note its sophisticated simplicity. If you find struggling to yank your cards out of your wallet on the fly, you'll love the smooth outer slip pockets. Cons: It's a little small in case you've got more than a few receipts and bills to carry. 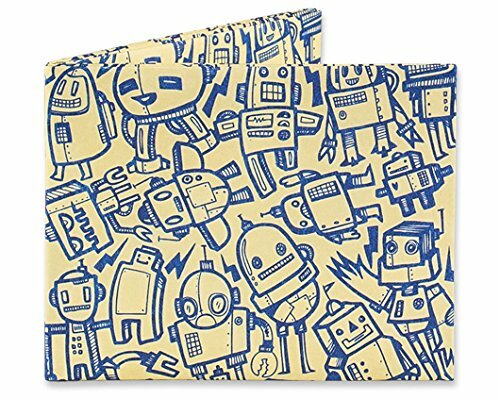 Squeeze a little more excitement into your day with this robot print wallet in sturdy beige and blue Tyvek material. Water-resistant with a stitchless origami design. Recyclable with a low carbon impact. Pros: It bends like paper, but it's pretty tear-proof. It can be tough to find wallets that last, which is where this strong Tyvek wallet comes in. You certainly won't be bored by it. Cons: Some reviewers find it a bit large. Love the Vans checkerboard skate shoes? You can get the same design in wallet form. Organized inside with a coin pocket, a clear ID section and a tidy card area. Advertised as vegan: No, but it's 100% cotton canvas. Pros: Let Vans refresh your streetwear style. Since it's made of durable cotton canvas, you shouldn't have to worry about it getting scuffed up or falling apart quickly. Cons: Sometimes Velcro can get worn out and stop sticking. This brown synthetic leather wallet comes with a money clip that'll help you keep track of spending. Shuts securely with a magnetic closure. Made with inner card slots for credit cards and ID. Advertised as vegan: No. However, the material is synthetic. Pros: Simple and unadorned, this wallet has class. With the magnetic snap closure, it won't flap open and dump everything out. Cons: If you have a sizable amount of cards to tote, it could be too small for your needs. Worried about remote theft? Pacsafe's RFIDsafe TEC Slider Wallet is advertised as capable of protecting your data from lurking scanners and readers. Built with a slider mechanism that allows you quick card access without fuss. Features cool lime green accents. Advertised as vegan: No, but it's polyurethane and microfiber. Pros: It's nice and thin, avoiding excessive bulk that makes other wallets hard to manage. Balance in style, it's plain but also a little snazzy with bright green details. Kavu's sporty bifold Seymour wallet in tan polyester material features a neat pattern that looks like a topographic map of a mountain range. Shuts with a Velcro flap. Comes with a detachable rope and carabiner to hook onto your belt loop. Designed with inner card slip pockets and a nifty flap compartment. Advertised as vegan: No, though the material is polyester. Pros: Active individuals can get some good use out of this wallet with its build-in carabiner. Just attach it to your person and forget it. Basic can be best. New Look's brown faux leather wallet is made with a snap latch to keep it safely shut. Well-organized for all your cash and plastic. Cleanable with a damp cloth. Advertised as vegan: Not as vegan, but as faux leather. Pros: You don't have to splurge on a nice wallet. This one is low-cost but looks like it's high-quality, suitable for any gentleman's wardrobe. Cons: Really, none that seem particularly problematic. The green and brown tone camo print Roy Wallet from Herschel Supply Co. is said to a utilize a secure RFID-blocking system for peace of mind. Accented with red and white striped fabric details inside. Designed with a generous card carrying capacity. Pros: It's a good-looking wallet. If you usually find your debit cards, ID and stamp cards getting cramped, you might enjoy the decent storage space. Cons: We can't say how functional the RFID system is. 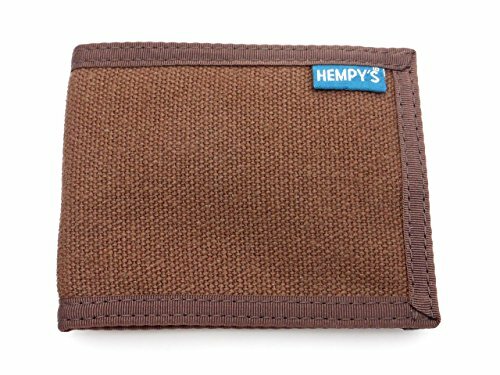 Hemp is super durable, sustainable and eco-friendly, which is why this vegan hemp wallet is so popular. Features eight card slots for methodical card arrangement. Advertised as vegan: No, but it's 100% hemp. Pros: The more you use it, the more flexible the material gets. It's breathable, too, so if you don't like the feeling of faux leather in your pocket when the weather gets humid, you might prefer a hemp wallet. Cons: No biggies to note.